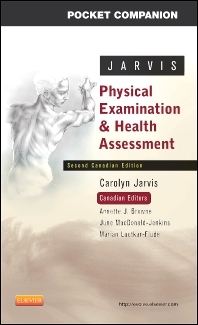 Ideal for quick reference in the clinical setting, this portable companion to Carolyn Jarvis’ Physical Examination and Health Assessment, 2nd Canadian Edition summarizes essential assessment skills and techniques for the most effective physical examinations. This convenient clinical tool provides fast, easy access to full-colour pathology photos and illustrations, health history, examination steps for each body system, normal versus abnormal findings, lifespan and cultural considerations, nursing diagnoses, and summary checklists. Convenient, colour-coded design helps students easily locate the information they need. More than 200 full-colour illustrations clearly demonstrate important anatomy and physiology concepts, examination steps, and normal and abnormal findings. Age-specific developmental competencies highlight important considerations for pediatric, pregnant, and aging patients. Cultural competency icons alert students to relevant cultural considerations in the clinical setting. Abnormal findings tables provide fast access to key information on many frequently encountered conditions. Assistant Professor, Queen's University School of Nursing, Kingston, ON.